Published: January 14, 2013 | This entry was posted in North American New Right and tagged articles, commemorations, Greg Johnson, Japan, literature, North American New Right, originals, Yukio Mishima. Both comments and trackbacks are currently closed. Is anyone here who can read 日本語 and is familiar with 三島’s works? Any especially recommendable writings or videos you could point out, other than the English-translated things mentioned in the article? Reisender, thanks for your interest in Mishima. 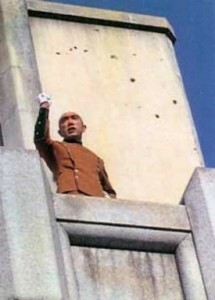 If you can read Japanese, you may refer to the special section of Mishima’s works at amazon.jp about which I provide the following link. Also, the homepage of the renowned Mishima Research Society in Japan contains rich contents of Mishima-related news, episodes, and research results. I also gladly provide its web address to you. What do you think of the bio by John Nathan? This attitude pretty much parallels the ideas of a political activist even smarter than Saul Alinsky. I also concur. Now there’s a hopeful thought. Jews win because they’re always attacking us, since the 1st century AD without a stop. I’ve read Flavius Josephus recently and he well could be Alan Dershowitz or Daniel Pipes, it shows that the jewish mind didn’t have changed in 20 centuries … High ethnocentricity and self-importance will be with the “chosens” forever. Would a political and cutral alliance with Japanese nationalist be helpful? I really appreciate these “how to get started on this particular thinker”-guides. Although it may not be that necessary with writers Mishima, it has helped me a lot when it comes to people like Heidegger and Guénon. It feels like one get to chance to actually make some progress when it comes to these ideas. The only other venue in the patriot/white nationalist movement that could do this was in my opinion Dr. Johnsons` show on VOR.